The Q5® Hot Start High-Fidelity 2X Master Mix features a high-fidelity, thermostable, hot start DNA polymerase with 3´→ 5´ exonuclease activity, fused to a processivity-enhancing Sso7d domain to support robust DNA amplification. The addition of an aptamer-based inhibitor allows room temperature reaction setup. With an error rate ~280-fold lower than that of Taq DNA Polymerase, Q5 Hot Start High-Fidelity 2X Master Mix is ideal for cloning and can be used for long or difficult amplicons. The convenient master mix formulation is supplied at a 2X concentration. The mix contains dNTPs, Mg++ and a proprietary broad-use buffer requiring only the addition of primers and DNA template for robust amplification regardless of GC content. When used at the recommended 1X final concentration, the Q5 Hot Start High-Fidelity Master Mix contains 2 mM Mg++. 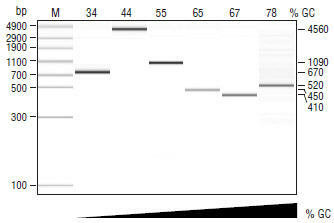 Q5 Hot Start High-Fidelity 2X Master Mix is unlike typical, lower fidelity PCR enzymes. To determine the optimal annealing temperatures for a given set of primers, use of the NEB Tm Calculator is highly recommended. Amplification of a variety of human genomic amplicons from low to high GC content using Q5 Hot Start High-Fidelity 2X Master Mix. All reactions were set up at room temperature, conducted using 30 cycles of amplification and visualized by microfluidic LabChip® analysis. Product specifications for individual components in Q5 Hot Start High-Fidelity 2X Master Mix are available separately. Hicham Bouabe, Klaus Okkenhaug A Protocol for Construction of Gene Targeting Vectors and Generation of Homologous Recombinant Embryonic Stem Cells. Methods in Molecular Biology . How should I set up a PCR reaction using Q5® Hot Start 2X Master Mix? How do I activate Q5® Hot Start High-Fidelity DNA Polymerase?